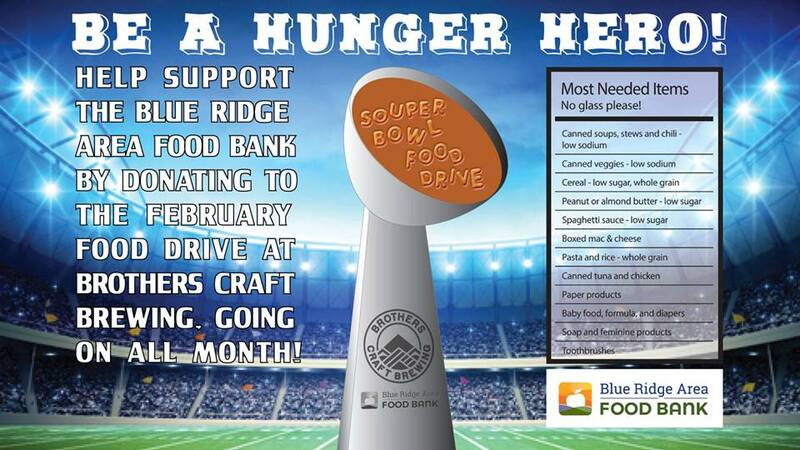 This February, we will be collecting food for the Blue Ridge Area Food Bank! Our collection will start on February 1, and our big kick off event will be during our Super Bowl Potluck and Watch Party! 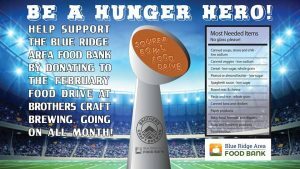 The Blue Ridge Area Food Bank is looking for food donations that are low sodium, low sugar, and whole grain items preferrably. All items must be packaged in a non glass container. See the list of most needed items below. We will be collecting donations everyday through February during taproom hours, and would like to fill the donation bin as many times as possible through the month. Let’s start by kicking things off by filling our first bin during the Super Bowl! Plan to bring your contribution with you when you visit the brewery, and make sure you are here for the Super Bowl Potluck and Watch Party to help fill the bin!